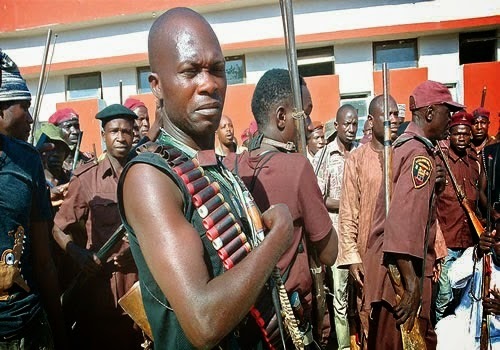 Rita Egwu – Over 500 traditional hunters armed with home made guns, poisoned spears and amulets are eager to use their black magic powers (Juju) to help find the abducted girls. Aged between 18 to 80, these traditional hunters have been waiting for the past two weeks in Bornu State to get an official approval from the Nigerian Military. With cow horn trumpets and echoing eerie war cries that can send shivers down the spin. These men were selected by their peers for their spiritual powers twirl around and stab themselves with no apparent harm. They also have herbs and other substances wrapped in leather pouches. with cowrie shells, animal teeth and leather bracelets they say they are impenetrable to bullets. They claim they are not saying they are better than the soldiers but they are laying claim to knowing the bush better. They say they have reached the end of their patience and if the government is not ready to use them then they will disband. A social commentator said: “I believe these men have what it takes to bring back our girls. This is Africa so we have an African way of solving issues that the west and their technology can not solve. I remember the days of Bakassi boys. They used charms to reduce crime in the east of Nigeria”. This entry was posted in Uncategorized and tagged 500 traditional hunters, Boko Haram, Bring back our girls, Chibok girls.